Welcome to Vermont’s “gateway community”, made up of several distinct villages, each with much character and beautiful scenery. Quechee is a quaint village which lies on the west side of Hartford, bordering Woodstock. 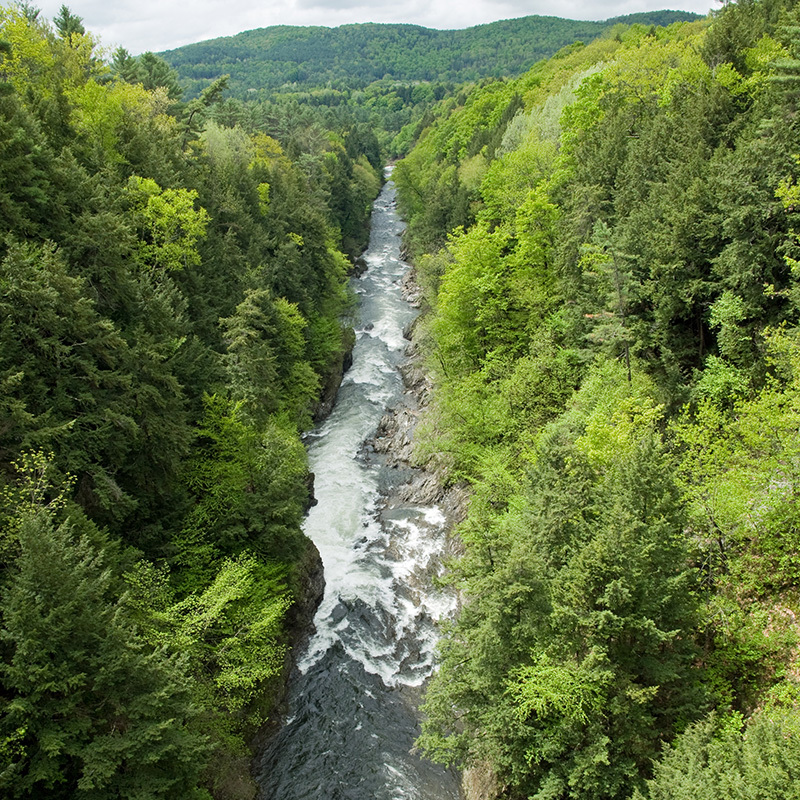 It holds many popular attractions, including the scenic Quechee Gorge, two 18 hole golf courses, the Quechee Polo Grounds, Simon Pearce glass blowing and potter facility, plus numerous shops and restaurants. It is also the site of popular festivals such as the annual hot air balloon festival and Scottish Games. White River Junction was named for its roots as the first and largest railroad center in Vermont and New England (north of Boston). The bustling downtown area is designated as a National Historic District, boasting urban architecture of the late 1800’s. A range of businesses, retail shops, and restaurants reside there, surrounding the railroad station and cultural offerings such as Northern Stage (professional theater company), art galleries, and museums. Hartford is home to many historic homes in its villages and rural areas. The village is a National Historic District. The village has produced tools, lumber, carriages, textiles, and chairs during its long history. Rural parts of the town enjoy the scenic White River, a crossing of the Appalachian Trail, and significant farmland and forests. Wilder is located on the Connecticut River and includes a mix of residential areas and newly developed commercial parks. The village is home to the Wilder Dam and Salmon Ladder. Many historic homes are located in Wilder, which borders Norwich, Vermont. Hartford has three Elementary schools, a Middle School, High School and the Hartford Area Career & Technology Center. Hartford lies at the crossing of I-91 and I-89, making it an easy drive to all points north, south, east, and west. The Upper Valley job centers of Dartmouth-Hitchcock Medical Center, Dartmouth College, and West Lebanon are just minutes away. For more statistics, please visit Realtor.com or the Town of Hartford.